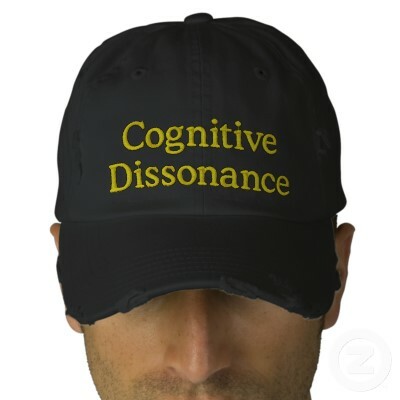 Each one of us has our own cognitive dissonance list. Right now, for example, I’m in the middle of planning for an important fundraising event at work. As a person of faith I believe fully that God will move in the details to make the outcome exactly what it ought be. But as a relatively neurotic and overly self-reliant person I also believe fully that the success or failure of the event rests 100% on my shoulders and if I drop the ball the whole endeavor will collapse in a heap. No pressure, of course. In reality, both statements have elements of truth: I need to work hard, and I also need to pray hard. That second part is the part I too often overlook. If you find yourself stressing out over some of these kinds of thoughts from time to time, it can be useful to stop and realize that cognitive dissonance is a very real psychological by-product of a very real internal conflict. Maybe the stress you’re experiencing stems from trying to balance two ideas in your mind that are in conflict with one another. You may not be able to resolve the conflict — that’s why it creates dissonance, after all — but at least understanding why the conflict exists might help you gain some clarity. News flash for each of us: we’re all more or less normal. Or are we? “I’m normal” versus “I’m abnormal.” Hmmm…there’s a concept sure to create plenty of cognitive dissonance in the best of us!